All of NICB’s development solutions for law enforcement agencies are provided free-of-charge. NICB works with thousands of law enforcement officers every year. Experienced NICB agents, most of whom formerly worked in law enforcement, deliver in-person classroom training nationwide, covering a wide variety of topics. Education and training on vehicle theft, vehicle identification, vehicle crime schemes and insurance fraud. Sharing information on what various insurance industry terms mean, as well as how the insurance industry handles claim processes and what types of evidentiary information is contained in claims files. 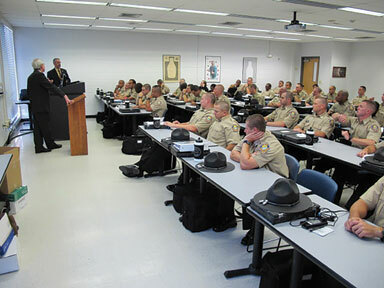 Entry-level fraud training presented at police academies so new officers gain an awareness of what NICB is and how the organization’s resources can help them in their investigations. NICB offers online insurance fraud training to law enforcement professionals free-of-charge at NICBTraining.org. These online courses will help you to spot the indicators of insurance fraud and vehicle theft, and many courses are available in both English and Spanish.